Although the team had limited success in their first few decades, the arrival of Bill Belichick and Tom Brady marked a turning point for the New England Patriots and they have been one of the best teams in the league since then. With the huge Boston market and the support of a large portion of the Northeast, the Patriots are very popular with fans and collectors. 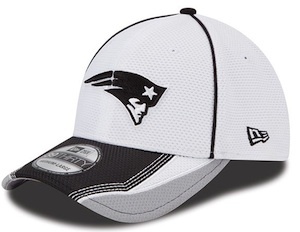 The following guide incldues a helpful shopping guide that is catered to holiday and birthday gift shopping for supporters of the Patriots. 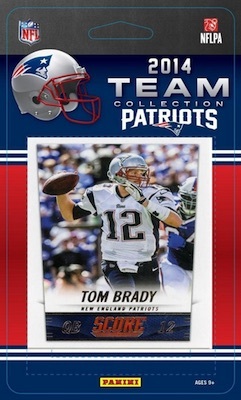 If you are looking for a more detailed account of the team from a collecting perspective, check out our comprehensive New England Patriots Collecting Guide. 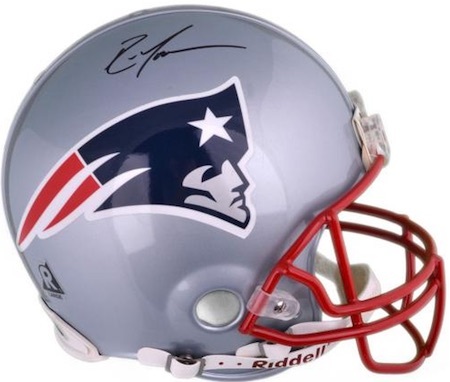 The list below features 20 different gift ideas for a fan or collector of the Patriots. Gift suggestions include specific and more broad options and a good variety of price points. 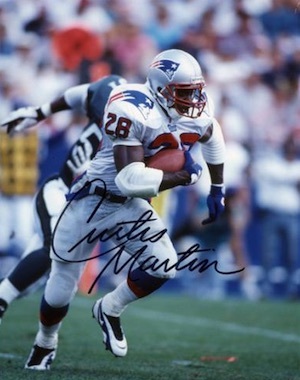 A Hall of Fame running back for the Patriots and Jets, Curtis Martin only spent a few seasons in New England. Team fans still remember him fondly and signed photos are an appealing gift option. You can't stop him. You can only hope to contain him. When healthy, Rob Gronkowski is one of the most dominant players in football. His dynamic ability and playful personality have made him a fan favorite in New England and signed footballs offer a great premium gift. 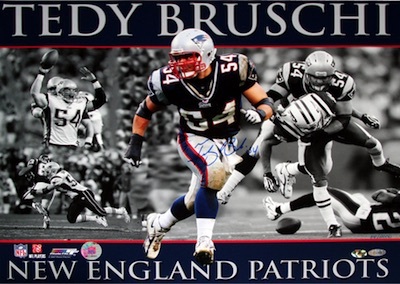 A Patriot for his entire career, Tedy Bruschi was a key piece of the defense for many years and he won three titles with the Patriots. Signed photos are an ideal way to remember the former defensive great. 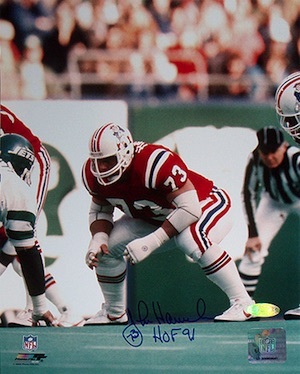 The very first Hall of Fame player inducted for the Patriots, John Hannah is considered to be one of the greatest offensive lineman of all-time. His autographs are reasonably priced and signed photos offer a good budget gift option. Although his time with the team was relatively short, Randy Moss was very productive with the Patriots. One of the greatest receivers in NFL history, Randy Moss signed helmets remain popular with fans and collectors of the team. 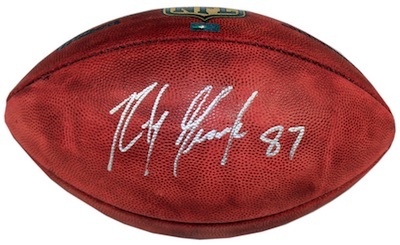 Hands down the most popular player in team history, authenticated Tom Brady signed memorabilia can be very expensive. 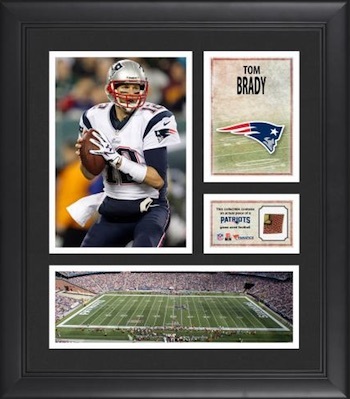 This framed collage offers an intriguing budget option and also includes a piece of game-used football. View plaques and collages for other Patriots here. 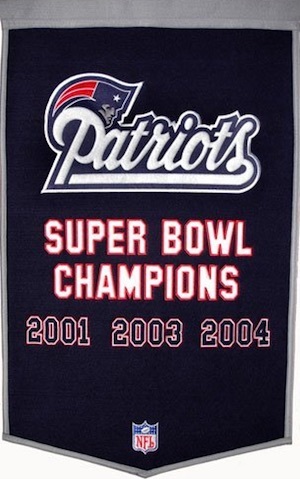 Fans of the team likely remember all three titles that New England won from 2001 to 2004. 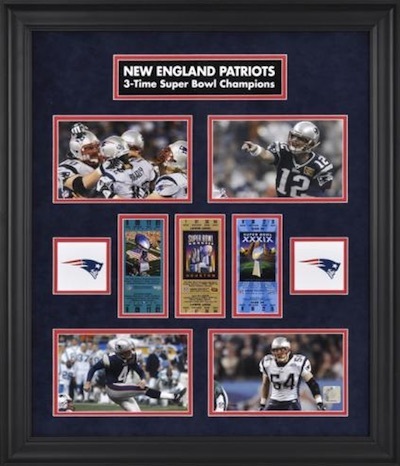 This framed collage celebrates those amazing years with replica tickets and images from each of the Super Bowl wins. 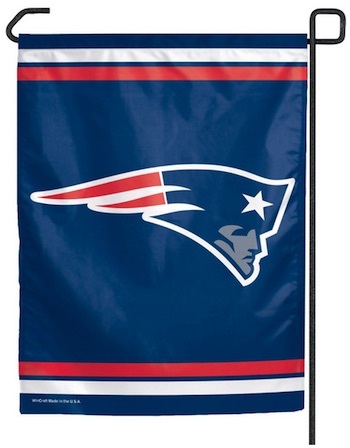 Carrying over the Super Bowl memories, this quality New England Patriots banner makes a great addition to a man cave or game room. 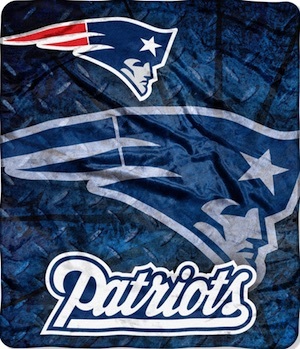 Warm Patriots blankets are a welcome sight in Boston during winter or for any team fan. This budget gift is nice way to for a fan to celebrate their favorite team. Not all gifts have to be flashy. This subtle garden flags offers a simple way to let the neighborhood know which team you follow. Another budget option for a Patriots fan, this tumbler is also a very useful way to house and transport beverages. 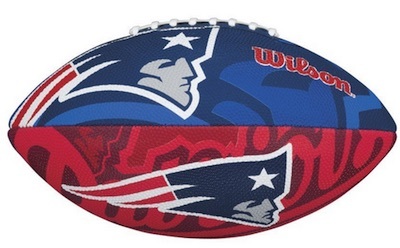 This colorful football features a bold look and a fun budget gift or stocking stuffer. Any combination of the garden flag, blanket or tumbler would make a great gift pack along with the football. Football cards are a popular option for fans, but they are not as simple to buy because they are so specific. 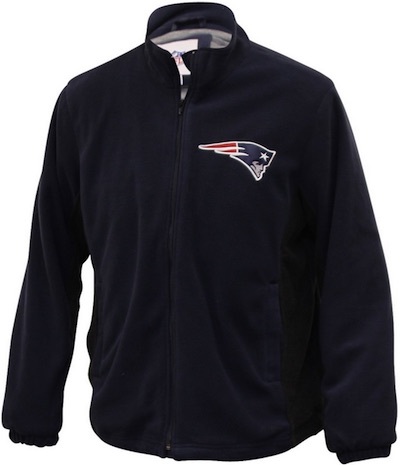 One option we recommend for budget gifts or stocking stuffers is New England Patriots team sets. Some are sealed and some are hand-collated, but the result is the same. Make sure to verify the year of the card and the players included to make sure you are getting what you expect. 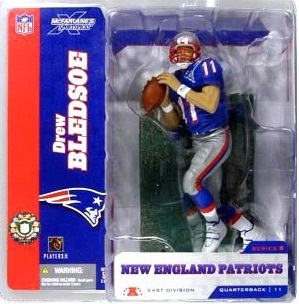 Whether shopping for a child or an adult, New England Patriots figures and bobbleheads can be a great gift. Several different brands offer a variety of options and many players can be found from the history of the franchise. Check out specific figures on eBay using the links below. There are a good variety of different New England Patriots team fatheads. 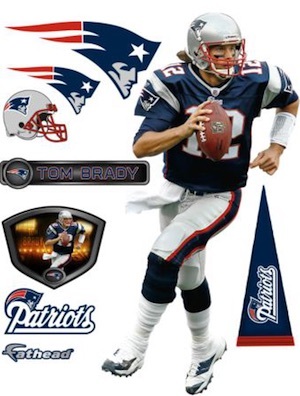 In addition to team logo versions, players are some of the top Fatheads and two of the most popular Patriots are noted below. 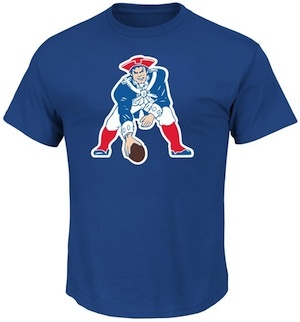 Smartphones are the new norm and can make for an easy and inexpensive gift for a New England Patriots fan. Just make sure to verify the exact make and model before you buy. We have included direct links to Amazon below for the most popular phone models. 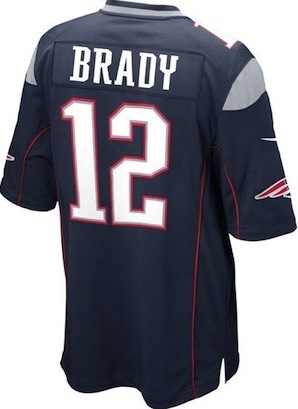 Jerseys remain the most common way for fans to display their love of the Patriots. Replica versions offer cheaper prices and fans can also have them customized for added appeal. If you are overwhelmed by the many versions, check our detailed NFL jersey guide here. COREY DILLON NEW ENGLAND PATRIOTS REEBOK JERSEY ON FIELD SIZE 56 PLEASE READ!